In the last few months I've received a surprising number of handwritten notes from people who don't speak English as a first language and don't generally speak English at all. I consider this my newest fetish. I share them with you now and feel oddly uncomfortable about it. 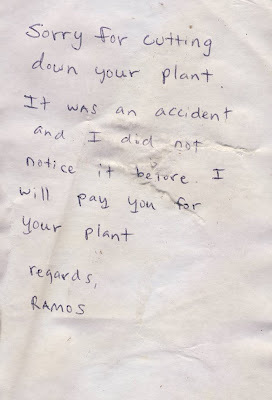 Ramos sounds like a total sweetheart. My first thought: this is a spoof on WCW's poem about the plums in the icebox... and not a bad one!